Nuts nuts nuts. I love eating nuts because it’s so great for your health and they are such a delicious snack! Yummy yummy. There are so many tortured nuts out there (no pun intended) where manufacturers try to put too much sugar, caramel, and oil. It makes a once very healthy snack into a saturated fat no no. My sister invented a recipe that takes 5 minutes, no mess, no oil and tastes like heaven. Here’s my take on it. 1 cup nuts of your choice. I used almonds and walnuts. 2 T organic raw sugar. I bought mine at Whole Foods. Those that are still in large crystals. Not the refined sugar. This is so easy, I’m smiling while typing this. Take your cup of nuts in and fill the cup with water (with the nuts still in there). Wait about 30 seconds and dump the water out, leaving the nuts. Now use a flat plate and pour the damp nuts (ha ha ha seriously no pun intended) onto the plate. Make sure you use a plate big enough that can handle all the nuts while spreading the nuts out so they don’t overlap. Now take the sugar and spread it over the nuts and mix so that the sugar is all even and sticking to the nuts. They’ll stick because the nuts are damp. Ok, now spread out the nuts again on the plate so they don’t overlap. Put the plate in the microwave (that’s right! no oven or oil needed – whoo hoo!) and microwave it for 2 minutes on high. Because microwaves vary, check the nuts to see if they are dry and smell a bit toasted. If so, then they’re done! Let cool and eat it up! Some microwaves are stronger so for the first time, you may want to try in 1 minute increments. Wasn’t that easy breezy? No, not a covergirl commercial. No oil, totally healthy, and it’ll help shrink those cysts. This entry was posted in General, Health Foods, Treatments and tagged Almond, Diet, Endometriosis Diet, health foods, Healthy Diet, Nuts Recipe, shrink endometrioma, Toasted Nut Recipe, Walnuts. Bookmark the permalink. 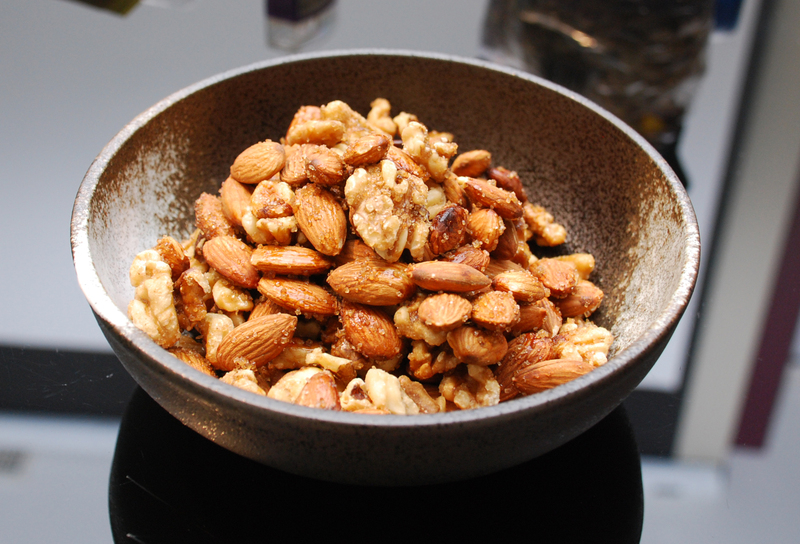 2 Responses to Toasty Nuts For Endometrioma – Oh and the Recipe! and reading the views of all colleagues about this post, while I am also keen of getting know-how.